By Chris Williams: Juan Manuel Marquez has fought Manny Pacquiao to a virtual standstill in their two previous fights in 2004 and 2008. Many boxing fans believe that Marquez was the better fighter in both fights and won more rounds. Sadly, Marquez has little to show for his two fights with Pacquiao other than a 12 round draw in their first fight and a 12 round decision loss in the second fight. Now they’ll be fighting again in November. The problem is that Marquez will be 38 by the time he enters the ring against Pacquiao, and he’s clearly not the same fighter he was three years ago when he last fought Pacquiao. 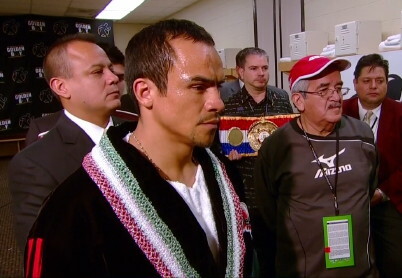 There’s no getting around it, Marquez has aged and is nearing 40 now. Marquez thinks that they waited him out until he got older to fight. It’s too bad that Pacquiao didn’t fight Marquez immediately or soon after the 2nd fight because Marquez is now almost Shane Mosley’s age and not the fighter he was in his youth. This has to taint a win that Pacquiao might get over Marquez because when you fight a guy that’s 38 and beat him, it’s not the same thing as fighting a guy that is in his early 30s or late 20s. And then when you add in the fact that Marquez will be moving up in weight to fight Pacquiao at 144 pound catchweight instead of a catchweight nearer to Marquez’s 135 pound fighting weight, it doesn’t look good for Marquez. It’s almost like he’s in a no win situation here. Everything is going against him – age and weight.